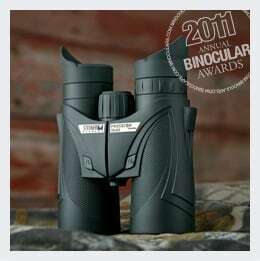 One of the largest on-line optical retailers in the US, Binoculars.com, have over the past few years conducted their own annual binocular awards where as they say: It "is our effort to review the year's additions and illuminate the great products that provide something special." Their results tend to come out early in the year as opposed to mine which come out towards the end of the year. I am not sure exactly how they go about choosing their winners, or indeed if they have any marketing motive or manufacturer pressure behind the winners. According to their site they say that to determine the winners, all binocular models are given a thorough visual inspection and graded according to specific criteria. Their in-house team of experts then subjects each binocular to exacting tests in the field to rate its performance. 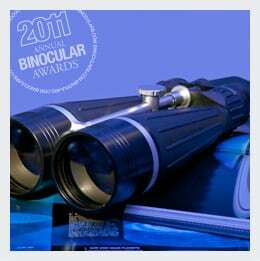 The standards used to judge a binocular's quality and performance vary for each award category. What Binoculars.com say: "Back-to-Back Winner! Save for a binocular revolution nobody saw coming, the Swarovski 10x42 EL Swarovision Binoculars is no-brainer for a second Binocular of the Year honor. Swarovision technology uses the best High Definition optics, optimized proprietary coatings, and field-flattener lenses to provide perfect resolution and clarity from the very edge of the field of view. They're incredibly comfortable to hold and use, and feature an effortless focus wheel bringing the viewer as close as 1.5 meters. When you want the best, be the best. 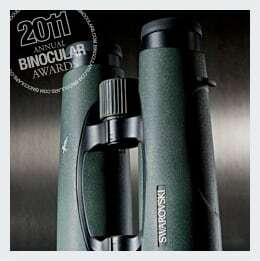 Get Binoculars.com's 2011 Best of the Best, 2 years running"
What I say: Agreed, If you are looking for one of the best binoculars that money can buy, then you wont go wrong with these Swarovski 10x42 EL Swarovision's. I really like their open bridge design and as you would expect with any pair of optics in this class, they use the best possible optical components and coatings. The Swarovski 10x42 EL SwaroVision Binoculars cost about $2500 in the US. What Binoculars.com say: "The first true game-changer in their class, the Bushnell 10x42 Legend Ultra HD Binoculars introduced this year provide superior light transmission normally found only in much, much, higher-priced models. Bushnell coated the Extra-Low Dispersion glass lenses with their patented Ultra-Wide Custom Band Coating to gather more light and show a wider range of bright, accurate colors than the competition, especially during dusk and dawn hours. These binocs don't skimp on the extras, either - they also feature RainGuard HD coating, comfortable grips and eye relief, and a huge field of view. Bushnell is so sure they've upped the ante that they've offered to buy them back from any unsatisfied customer for a full year… we doubt they'll have any takers. The Bushnell 10x42 Legend Ultra HD is more than worthy of Binoculars.com Binocular of the Year Award"
What I say: Whilst I have not personally reviewed these, I must admit that their specifications do look impressive. Bushnell have used a whole host of quality optical components including extra low dispersion glass in the lenses which gives the designer of a multi-element objective lens a wider range of options with which to control and minimise aberrations, in particular, chromatic aberration by concentrating and directing the light more effectively. What also looks very impressive on these is their field of view (340ft @ 1000 yards) which is very wide for a 10x42 Binocular and ranks them with the very best in this department. These 10x42 Bushnell Legend Ultra HD Binoculars cost about $250 to $350 in the US and £300 to £400 in the UK. 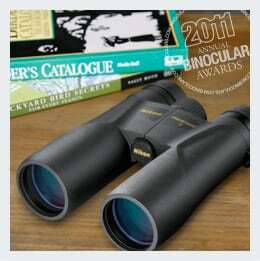 What Binoculars.com say: "In true avian style, a birding binocular needs to be light, quick, and clever. This year, the Nikon ProStaff 7 8x42 flew high above the competition, fitting multicoated lenses, high-quality coatings, and comfortable grips in a lightweight binocular under $200. Long, nitrogen-filled twist-up eyecups ensure user comfort during extended birding sessions, and bright, clear views make for easier, faster identifications. A rare bird indeed, the Nikon ProStaff 7 8x42 is Binoculars.com's Best Birding Binocular of 2011"
What I say: Like their last years winner for the best birdwatching binocular, this years choice of the Nikon ProStaff 7 8x42 is a rather strange choice. 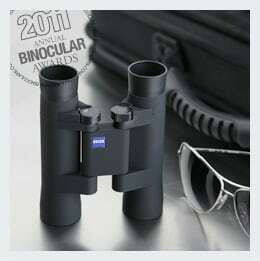 Not that they are a bad binocular, far from it. The problem for me is their rather narrow field of view. At only 330ft wide at 1000 yards, it is less than the Bushnell Legend above and that has a 10x magnification! To be a really good birding binocular, I would be looking for something with a field of view nearer or even over 400ft wide at 1000 yards. Other than that and if the field of view is not that important to you, they do look like a pretty good pair of optics, especially if you take into account their low price point. Quality features include: Fully Multi-Coated Lenses, Phase correction coatings on the Prisms and an impressive 19.5mm of eye relief. The 8x42 Nikon ProStaff 7 Binoculars cost about $200 in the US. What Binoculars.com say: "The best travel binocular is one that can be taken anywhere, readied in an instant, and provides consistently crystal-clear views. This year's best traveling show is the Zeiss Conquest 10x25 B T Compact Binocular - the ideal combination of high-end lenses and innovative portability. Cleverly hiding multicoated lenses and Schmidt-Pechan prisms inside a totally original Z-fold design, these comfortable, light, and brilliant binocs are our Best Travel Binocular of 2011"
What I say: This is a great choice as not only do these Zeiss binoculars have whole bunch of quality features like phase correction coatings on the prisms, but because of their duel hinge design they are far more compact when folded than most compacts that only have a single hinge and are therefor an ideal travelling companion. For more on this, take a look at my article on the Best Compact Pocket Binoculars. What Binoculars.com say: "In the field, both predator and prey do their best to blend seamlessly in the background; our 2011 Best Hunting Binocular does everything to stand out. The Steiner 10x42 Predator Xtreme employs optics with Color Adjusted Transmission to allow objects (like deer) to "pop" out of the background. Steiner set out to build the perfect specimen hunting binocular - and succeeded. 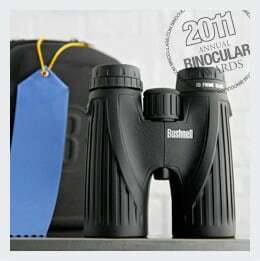 Binoculars.com's Best Hunting Binocular of 2011 is also waterproof, comfortable, and built like a tank." What I say: Steiner have a long history of producing excellent binoculars especially for the military and for hunting and these are no different. The Steiner Predator Pro Xtreme 10x42 Binocular comes with their contrast-enhancing optics designed to filter layers from inbound light and produces a bold color contrast, which is said to increased ability to spot game in wooded situations. The 42mm objective lenses gather plenty of light to perform from dawn to dusk, and the rubber armoring, flared eyecups, and ergonomic design means that they are not only tough, but very comfortable to use. The 10x42 Steiner Predator Xtreme binoculars cost about $430 - $500 in the US. What Binoculars.com say: "Back-to-Back Winner! These huge astronomical binoculars weren't new this year, but they boast specs and a price that stand the test of time. The Zhumell 25x100 Tachyon Astronomy Binoculars have 100mm objective lenses, fully multi-coated optics, and awesome filter-ready lenses. If you're ready to take back the sky from one-lensed elitists, these are the binoculars to get (both) your hands on. Super rugged and tripod-adaptable, the Zhumell 25x100 Tachyons are Binoculars.com's 2011 Astronomy Binocular of the Year"
What I say: For astronomy, I really like the fact that these Zhumell 25x100 Tachyon binoculars take standard, 1.25-inch astronomical filters to enhance your views of the moon, planets, nebulae, and other celestial bodies. The huge 100mm objective lenses and the fact that they are fully multi-coated makes them ideal for astronomy use as they will not only gather much more light than ones with smaller lenses, but the anti-reflection coatings will ensure as much light as possible gets to your eyes. Zhumell Tachyon 25x100 Astronomy Binoculars cost about $220 in the US.